ON September 14th 2017, I was one of a handful to attend Nike’s “Process of Collaboration” talk within London’s Barbican centre; this was an occasion in which 5 of “The Ten” were released. Guest speakers included both Virgil Abloh and Nate Jobe; Nike’s Senior Design Director, who answered questions towards the end of proceedings on top of signing merchandise. As the event got underway, we were informed 60k had applied alone for this particular ‘workshop’, leaving myself to be one of the lucky number. Topics hopped from Virgil’s first teased silver-tick Air Force 1, to art and architecture, then inspiring others to follow in their footsteps and achieve personal goals. Not one stone was left unturned when it came to details. 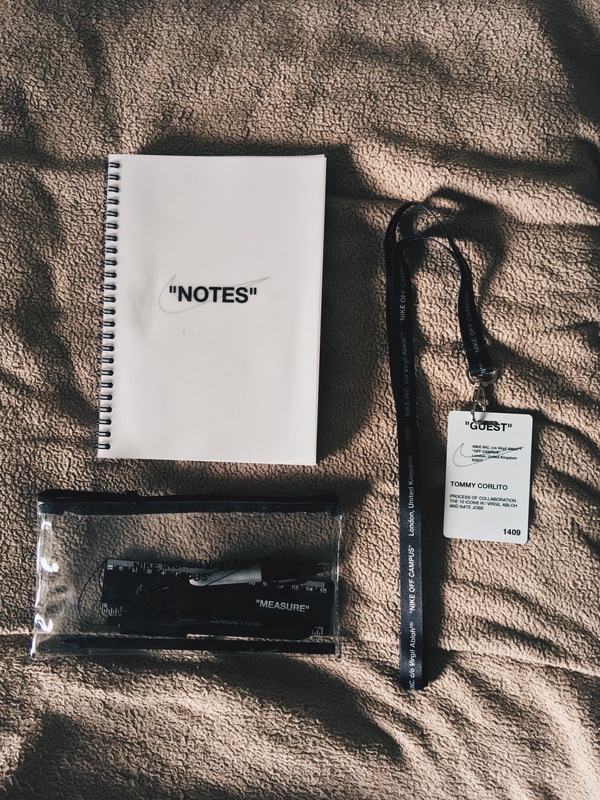 Upon arrival guests were given lanyards and passes, to be shortly followed by branded stationary, a pencil case, a notebook and bottled water. Virgil started by introducing the collaboration as a whole, he described it as a ‘design project’ opposed to simply working hand-in-hand; highlighting how they weren’t aiming to ‘create another version of a shoe you already have’. As a youngster he would ‘sketch the outline of sneakers, send them to Nike’ and receive ‘rejection letters’ in an attempt to attain his ‘dream design job’, then finally feeling like the schoolboy of his youth once Nike eventually got in contact. For his grade school group, it wasn’t enough to ‘just wear them, we [they] wanted to participate, wanted to tell Nike….our dream design job’. Jobe built on this point by noting the extent to which our ‘younger generation’ are re-writing street-culture as a whole, using Nike’s t-shirt and sneaker design workshops as examples of self-influenced innovation. Both described the standard silhouettes as ‘a canvas’ to build from opposed to a ‘colouring book’- evidently these new concepts gained popularity from when the very first spoiler hit social media outlets. ‘If I had my way, I’d have bits hanging off everywhere’. ‘This is an education, we’re in the Barbican for a specific reason, because we want to have this dialogue…so I’m just going to give you the cheat codes at every moment’. This was then followed by an answer to the question; since Pyrex, Virgil had been building his image within the fashion industry. His ‘resumé’, or image, was the most important part of becoming such an immense figurehead; emphasising how his aim was simply ‘getting work out’. ‘If you’re here with creative ambition, you just so happen to like inanimate objects like sneakers…you can make these, but the meeting point comes through work, it doesn’t come through chance’. Now, a topic MANY sneakerheads have been dying to hear about; the story behind Off White’s teased black Air Force 1. This pair features a metallic silver swoosh stitched in a similar style to the Vapormax above; instead of “AIR” however, Off White’s standard print sits. So, will this ever hit retailers? Unfortunately, it doesn’t seem to be leaning in that direction, in fact, the bottom-line is Abloh didn’t want to leave Oregon Campus without something to show for his efforts. It was a filling pair. Working with Matt Kilgore, son of Air Force 1 designer Bruce Kilgore, they created the project predecessor by hand. Giving Nike’s perspective on this area, Nate Jobe explained how this showed ‘the human level’ of production, where trial and error from the kitchen shined through. Instead of tying one designer to a shoe, teams are given designated projects and problems to overcome. Towards the hour-mark of constantly being bombarded by questions, both Jobe and Abloh spoke a little more on the topic of their design team throughout. They touched briefly on designer Heron Preston amongst others coming together as ‘a big family’, all being of ‘equal importance’ when it came to the final product. A worldwide team of design specialists gave input and insight; for example influence as to each silhouette. The Air Max 90 was heavily influenced by London’s ‘rave scene’, the Air Jordan 1 by skateboarding in Chicago youth-culture; although he admitted to being told which silhouette’s to work on, there was a high sense of heritage maintained on each pair. At another point, they explained how it was a challenge to avoid the ‘Hypebeast scroll’- ‘how many versions of the Jordan 1 are there, in a colourway?’ We can clearly see that each of ‘The Ten’ are completely different, but just how many stand out? With a little personal viewpoint, I feel the primary five will be held as royalty so to speak, those of which are sought after based on their features or lacking as such. In November, the second half of this collaboration will release along side an increased number of the primary five- factoring this and their bland palette, I can’t see them having as much of a stronghold on our modern sneaker-market. As Nike’s presentation came to an end, Jobe and Abloh built on a number of points made prior- in particular the train of thought behind disembodying the Jordan 1. This involved ‘poking around’ inside of the shoe, piercing airbags and simply cutting the sneaker apart to work into technical features of Jordan Brand’s most iconic design. Finding Nike’s hidden bubble launched Abloh’s “AIR” branding across each pair, as this, in a rather backwards way, made the bubble visible. Every last detail was heavily edited from Nike original silhouettes, whether it be the 90 and Jordan 1 toe box materials being inverted, the addition of ” ” around shoelace, air, and other notable attributes, or even Off White’s bottom line of instep print noting each shoe’s debut year. Virgil Abloh didn’t hold back even slightly. As a whole, Nike collaborated brilliantly with Off White. Instead of working on footwear we already have, Virgil added his own idea, making ‘The 10’ as individual as possible. Sneakerheads crave individuality, I see this project to be one similar to Acronym’s AF1 or Presto and Tisci’s AF1; what makes those aforementioned special is their ability to turn heads- even the general public who wouldn’t otherwise be interested in sneakers would take notice. Although major cities will be flooded with pairs come next weekend, five or six years down the line Virgil Abloh’s first Nike collaboration will be a landmark that new collaborating designers will try to achieve. If workshops hadn’t been Nike’s way of selling pairs off; a re-run of Staple’s Dunk would have certainly happened. Even though there were incidents of customers being robbed of pairs once venturing into Shoreditch, we have to draw a line as to how much Nike can really control. This has undoubtedly been one of the most highly anticipated Nike collaborations in years, and hype can only build towards November. Personally, I feel Virgil and Nike nailed this release, I can only hope for more of the same in coming years.